Mouthfeel, presented by Big Rock Candy Mountain, features sticky, pliable, and oral forms that center on the mouth as a means of aesthetic perception and production. The exhibition opens on Halloween night, alongside the launch of Q.A. 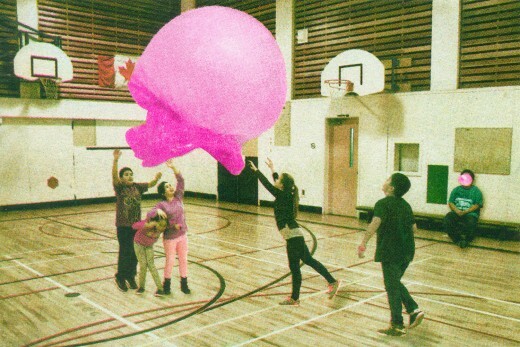 CHEW, a large edition of chewing gum developed with students from Queen Alexandra Elementary School. Q.A. CHEW is a commission of the City of Vancouver Public Art Program as part of Big Rock Candy Mountain, a multi phased project initiated by Hannah Jickling and Helen Reed. Big Rock Candy Mountain is a flavour incubator and taste-making think-tank produced by Other Sights for Artists’ Projects. Flavour historian and writer Nadia Berenstein will host a public talk in the Luxe Hall at Western Front. The event will discuss the past century of taste cultivation, including how notions of “natural” and “artificial” became measured, manipulated, and manufactured. Berenstein has written for The Guardian, New Food Economy, and Vice Munchies. Big Rock Candy Mountain, Tall Tale (Division 7), Risograph Postcard, 2016. Image courtesy of the artists.